I love making gifts for babies! I crochet baby blankets as well as put together scrapbooks, and another creative project, adding a final touch to the gift, is creating a gift tag. Today's digital image is the perfect element for a gift tag for a baby shower gift. 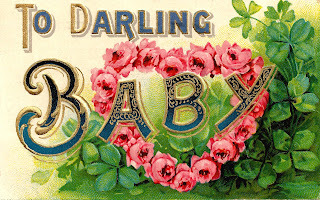 This image is from a vintage postcard, and it so lovely. I hope you enjoy!